Where is the Hope? 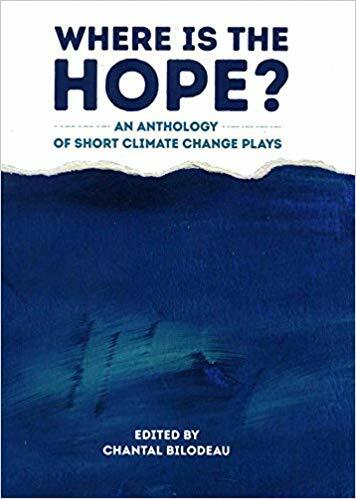 An Anthology of Short Climate Change Plays is a collection of 50 short plays by writers from all over the world, commissioned for Climate Change Theatre Action 2017. A creative response to the question “How can we inspire people and turn the challenges of climate change into opportunities?” the plays offer a diversity of perspectives and artistic approaches in telling stories that may point to a just and sustainable future. In 1893, Arctic explorer Fridtjof Nansen unwittingly opened up the Arctic for development. He set sail on his ship, Fram (which means “forward” in Norwegian), seeking the North Pole – and didn’t return for three years. Forward is a relay race through time, from 2013 to 1893, where each generation passes the baton to the next. In Inuit mythology, “sila” means air, climate, or breath. Bilodeau’s play of the same name examines the competing interests shaping the future of the Canadian Arctic and local Inuit population. Equal parts Inuit myth and contemporary Arctic policy, the play Sila features puppetry, spoken word poetry, and three different languages (English, French, and Inuktitut).